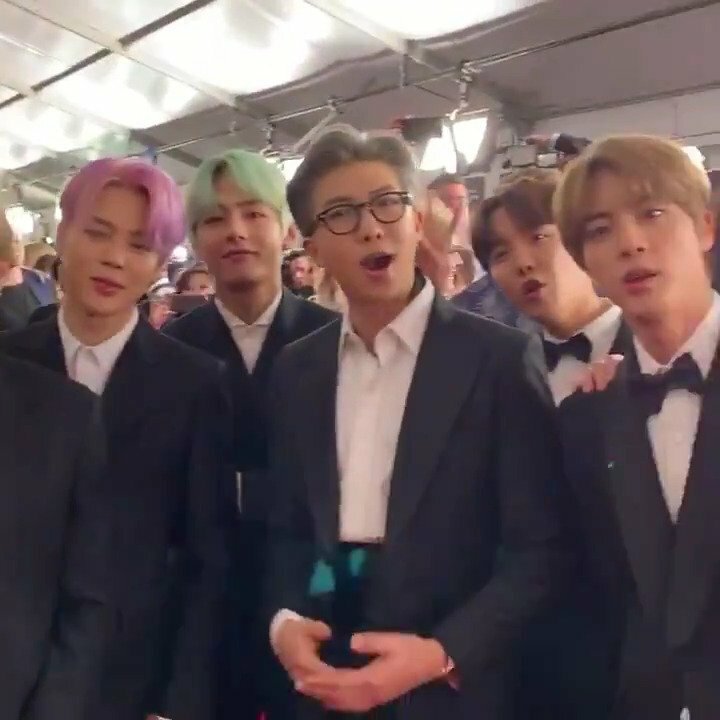 Entertainment Tonight's tweet - "We could listen to the boys saying "We are BTS and we're here at the #GRAMMYs" on a loop forever, tbh! #TearItUpBTS "
"Somos #BTS y estamos en los #GRAMMYs "
don't forget to stream on spotify/apple music!! YOONGI IS JUST SMILING!! MY CUTE LIL DUMPLING IS HAPPY !! #TearItUpBTS #GRAMMYs @BTS_twt #BTSxGrammys #AlfombraRojaE! Pudriamos escuchar a los chicos diciendo "Somos BTS y estamos aquí en los GRAMMYs" una y otra vez por siempre. WE COULD TOOO 😭😭😭😭😭😭😭😭😭😭😭😭 #TearItUpBTS @BTS_twt. Los amo mis bbs tan hermosos me muero lpm....!!!! "Somos BTS y estamos en los Grammys"
"Hola, Entertainment Tonight. Somos BTS (woohoo!) y estamos en los GRAMMYs". It just hit me for real that the First Time BTS presented an award, it was to Janet Jackson, and the Second Time they’re doing so, IT’S AT THE GRAMMYS for the R&B category!! !